A taste of Shanghai is now available until November 16th at Sheraton Grande Walkerhill's Gold Dragon, Chinese restaurant. 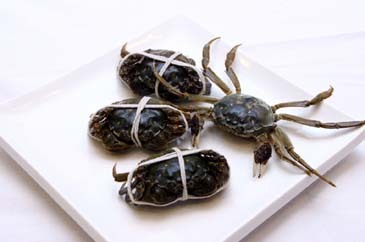 Prepared especially for this season, Gold Dragon will be showcasing a "Shanghai Crab cuisine" which includes every delectable dish to be served with the finest grade of Shanghai crab roe. The highlight of the promotion is that live crabs will be chosen and prepared to guarantee the quality and freshness of the crabs served. Let the tantalizing smells and tastes of Shanghai please your senses as you enjoy the specially prepared diverse crab menu has been which includes rare delicacies such as steamed shark fin flavored with the rich sauces of Shanghai tradition. One can chose from a variety of dishes such as the "Shanghai crab dish" (40,000KRW per crab), "steamed shark fin" (100,000KRW per crab) or splurge on the "steamed dry shark fin" (150,000KRW per crab). The Shanghai Course Set priced at 100,000KRW is an all inclusive course offering: Huai Yang style of cold dish, Fried crispy prawn wrapped in rice noodles, Pu Dong style of Seafood & Beef tenderloin and Steamed Shanghai Crab. In celebration of the season, Walkerhill's Gold Dragon would like to invite you to experience a taste of Shanghai. all inclusive course offering: Huai Yang style of cold dish, Fried crispy prawn wrapped in rice noodles, Pu Dong style of Seafood & Beef tenderloin and Steamed Shanghai Crab.